 We enjoyed these at a rooftop restaurant in Manhattan (photo courtesy McKittrick Hotel | NYC). Just a taste, from Tsunami Sushi in Lafayette, Louisiana. 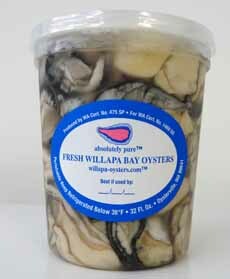 A quart of oysters from our favorite oyster grower, Willapa Oysters. They’re grown in the cleanest waters in the USA (photo courtesy Willapa Oysters). Every so often we pass a quart of shucked oysters in our fish store, and think: Do we have time to fry oysters tonight? 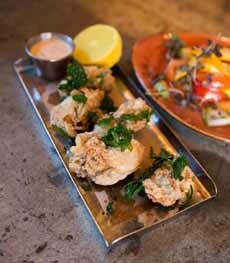 We like to serve fried oysters as a first course, on a bed of greens with remoulade sauce, which also dresses the salad. 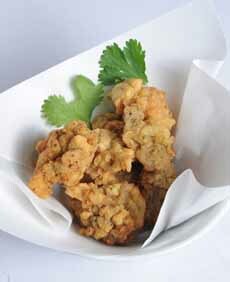 There are different approaches to fried oysters. Some people dredge them in flour, then an egg wash, then bread crumbs. If the oysters are good, they should release their flavor as close to your palate as possible. No extra layer of breading is required…or desired. That’s also why we won’t turn the oysters into a po’ boy: The bread gets in the way of tasting the gems of the sea. The remoulade recipe is a spicier variation of the French classic: a version you’d find served with fried oysters in New Orleans. You can make the remoulade 1 to 2 days in advance to let the flavors meld. You can use a pot or a deep skillet to fry. 1. MAKE the remoulade sauce: Combine the ingredients and refrigerate until ready to serve. 2. DRAIN the shucked oysters. Season the milk with garlic powder, paprika and hot sauce, and soak the oysters for 30 minutes before frying. 4. WHISK together the flour, cornmeal, salt and pepper together in a separate casserole dish. When ready to fry, drain the oysters and dredge through the flour mixture, coating completely. Tap off the excess flour. 5. FRY in batches of 4 or 5 (the oysters need space between them), using tongs to place the oysters in the hot oil. Cook until golden brown, about 2 minutes (“rare” is better for juicy, succulent oysters). 6. DRAIN for a minute on a paper towel-lined plate. Serve hot atop the greens with a lemon wedge and ramekin of remoulade sauce. *There are approximately 32 medium-large shucked oysters per quart (4″ across in the shell before shucking). †Creole seasoning is a mix of paprika, cayenne pepper, oregano, dried sweet basil and other spices, depending on the producer. Cajun seasoning is a mix of garlic powder, paprika, black pepper, onion powder, cayenne pepper, oregano, thyme, and red pepper flakes. If you don’t want a spicy remoulade you can leave it out; or mix some of the ingredients you have to get the 1-2 teaspoons for the recipe.